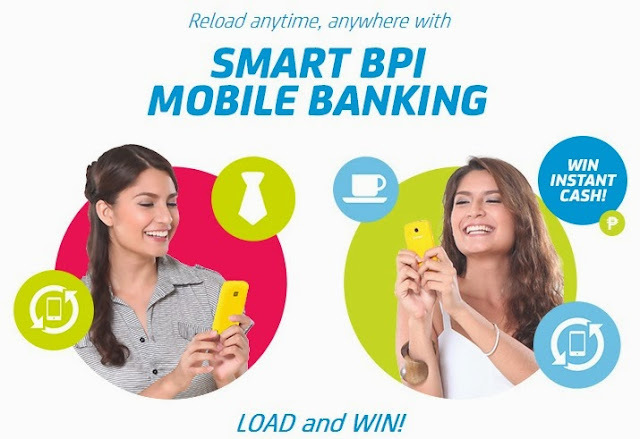 Smart Communications Inc. (Smart) announces an airtime loading campaign, "Bank, Load and Win with BPI" Promo where P1,000 will be given to 25 winners in the monthly draw, and P10,000 to 10 winners in the grand draw. Get 24/7 Smart Prepaid loading convenience when you link your BPI account to your Smart Money account using Mobile Banking. Bank of the Philippine Islands (BPI) Express Mobile 24/7 Banking has partnered with Smart for Prepaid Cellphone reload option. The facility allows you to reload value into your own or someone else's prepaid cell phone account by debiting your deposit account real-time. All Bank of the Philippine Islands, BPI Family Savings Bank and BPI Direct deposit accountholders are entitled to join the "LOAD AND WIN" promo. The Promo is from October 15, 2013-January 15, 2014 only. Clients can earn one (1) electronic raffle number for every prepaid reload they make to their SMART or Talk 'n Text SIM via BPI's SMS-based mobile banking through Smart within the Promo Period. Once a winner in the monthly draw, a client can no longer win in the grand draw. Winners will be informed by BPI within 15 calendar days from the time of the draw via registered mail. Likewise, an SMS and callout will also be used to inform the winner. A list of winners will be posted on BPI Express Online and Smart Money’s website. To claim the winning Smart Money card, winners should present the letter, their bank card/passbook, and a valid government ID. Should a representative need to claim the prize for the winner, he/she must present the same requirements plus an authorization letter from the winner. The winner should also accomplish a Smart Money application form for application-compliance purposes. Winners have sixty (60) calendar days to claim their prize from the receipt of the registered mail. They may claim their prize at 12F Ansons Building ADB Avenue Ortigas from Mondays-Fridays (10:00-12nn). Winners outside Metro Manila may choose to claim their prize in the nearest Smart Store but must bring the requirements as stated previously. All Bank and Smart employees including relatives up to the 2nd degree of consanguinity or affinity are disqualified to join. Prizes not claimed within ninety (90) days from receipt of registered mail will be forfeited. In case of dispute, the decision of SMART and bank with concurrence of DTI will be final and binding.